I spent Friday and Saturday, October 23-24, 2015, finishing off my final miles of the entire 550+ mile Appalachian Trail in Virginia. I set a goal to complete this entire trail portion about 5 years ago, and have been chipping away at the miles in earnest for the past 3 years with increasingly long drives away from Charlottesville. This drive was to Beartree Gap Day Use (Fisherman) Parking, and the drive from Charlottesville took 3 hours and 23 minutes, 237 miles, with no time stopped. Beartree Gap was the location where I ended my previous A.T. hike and their day use fisherman's lot is a great place to park - a small, free USFS lot that is off the highway and hidden from those drivers, yet only 10 minutes off of the trail. It even has a porta-potty and trash cans. The plan was to park here, hike into Damascus, and then shuttle back to the car using the host of the hiker hostel my dog and I stayed at that night. This is really the best way to do it, as I'd rather be waiting for a shuttle in Damascus - where there is stuff to do and other ride options and cell service - than at a remote USFS parking lot that probably doesn't have any of those things. After the shuttle, I would park the car at the hostel until our entire hike was complete later the next day and we returned home. Near the entrance to the parking lot is a paved trail that splits right almost right away, taking you along the south end of Beartree Lake. You can see the beach on the other side of the lake. Take a right at the end of the trail, and follow a purple blazed trail across U.S. 58 and reach the A.T. at the 0.6 mile mark. After reaching the A.T., I took a right to go southbound, and started climbing. Though not a big climb (300 feet), it had me stopping to strip a layer almost immediately. After a short ridge walk, I lost all that elevation, then climbed again to hit the high point of the both days' hikes at the 2.3 mile mark - 3438 feet. Beartree Lake, looking north, from Beartree Gap Trail on the way to the AT. A blue-blazed side trail leads to the Saunders Shelter right at the hike's 3 mile mark. I wanted to see the Saunders Shelter - it is the southernmost shelter in Virginia, and while hiking I was thinking about how I had passed by many shelters not situated right on A.T. The Saunders Shelter is in a pretty spot with some flat ground behind it. The shelter itself was clean, though there was a ton of graffiti all over the exterior. In fact, it was the most graffiti-filled shelter I remember seeing in Virginia. LNT! Shortly after returning to the A.T. from the Saunders Shelter access trail, the trail descended via 18 switchbacks from about 3400 feet to about 2500 feet. Near the bottom is a side trail to the Virginia Creeper Trail - this appears to have been an earlier alignment of the A.T., which then continued south on the Virginia Creeper Trail. Looking at the map, I thought that the A.T. merged into the Creeper Trail and I'd be competing with bikes for space, but the A.T. parallels the Creeper Trail. While the A.T. stays to the north of the Laurel Creek, the Creeper Trail crosses back-and-forth several times. This is an area with strong beaver activity. Beavers attack trees on the A.T. near Laurel Creek. Right in this area, I ran into a couple of guys that probably qualify as the strangest two characters I encountered in my entire 550 miles of A.T. Though clean cut, they were dressed head-to-toe in black, including black referee sneakers and black external frame backpacks, these two guys asked me if there were any springs along the trail in the near future. "We have been hiking up from Damascus and we are getting thirsty," they explained. I had two Nalgene bottles filled with water - one for me that I had frozen the night before and one to pour in the dog's bowl. I offered them the water in the dog's bottle. After some protests, they proceeded to drink 2/3 of the bottle, and when I told them to pull out their water bottles and I'd pour them the rest, was told, "our bottles are too deep in our packs for us to get out." Really? They told me that they were missionaries, out to tell hikers about Christ. When I asked how that was going, they told me that they haven't had a lot of luck, because "folks on the trail seem to be in such a hurry!" They then asked me where I lived, and when they determined I lived over a three hour drive from our meeting spot, asked if I knew of anyone that would put them up for a few days because it was supposed to get cold soon and they wanted to wait until it warmed up again. This, from a couple of guys who had been on the trail for a total of 5 miles! I couldn't help them and moved on, but it wasn't 5 minutes before the trail crossed a small stream with clean water. Somehow, I don't think those guys will get very far. A section of the Appalachian National Scenic Trail (A.T.) near Straight Branch and US-58 east of Damascus, VA, has been rerouted indefinitely due to the complete washout of the Straight Branch A.T. Footbridge during a high water event in May 2013. The reroute (detour) follows portions of the Beech Grove Trail (#4552) and Virginia Creeper Trail (#4575). This detour is expected to be in place for the foreseeable future, as A.T. management partners plan for the construction of a replacement footbridge. Here, the detour is very prominently indicated. The detour direction is indicated clearly. After only 0.2 miles on the Creeper Trail I came to a bike trail parking area, with bathroom. (Keep this in mind if needed, even after the detour on the A.T. ends.) Unfortunately, there was so much activity here that it was easy to miss the poorly marked A.T. signs. I hiked another mile on the Creeper Trail before concluding that I was no longer on the detoured A.T. After hiking that mile back again, I saw that the A.T. follows the access road to U.S. 58, crosses the road and follows the Beech Grove Trail about 0.2 miles before reconnecting with the A.T. This is a very short detour - don't do what I did! Here, it is nearly impossible to see the detour, and I missed it. Can you see it? It is marked on a metal strip that is behind the bike leaning against the rock on the opposite side of the road. I went up and looked at the kiosk, which said nothing about the detour, before continuing past the bathroom on the bike trail. Back on the A.T., I had my last major ascent of the day. But to call this "major" is an overstatement, as it ascended only 640 feet over 1.75 miles before leveling out, and then dropping 900 feet over 1 2/3 miles. At the high point, the A.T. intersected with the Iron Mountain Trail, which was the original A.T. alignment, before the trail went through the Mt. Rogers Highlands. Today, hiking the Iron Mountain Trail makes for some nice multi-day loop hikes with the A.T. I would not trust the shelters on the IMT, though, as when I camped with the Boy Scouts at the Cherry Tree Shelter in 2012, it was falling apart. Link. 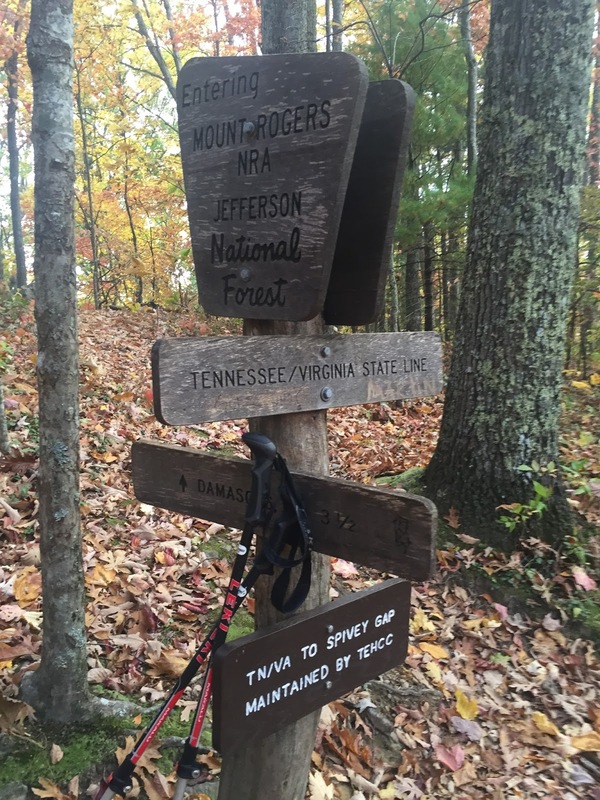 Iron Mountain Trail connects with the Appalachian Trail. View on the Appalachian Trail, a little north of Damascus. Soon after passing the IMT, the sounds of road noise increased, and I soon came to the wooden steps that descend to U.S. 58. I had seen these several times from the road on various trips, but never used them. Cross 58, and you are back on the Virginia Creeper Trail - both trails merge coming into Damascus. 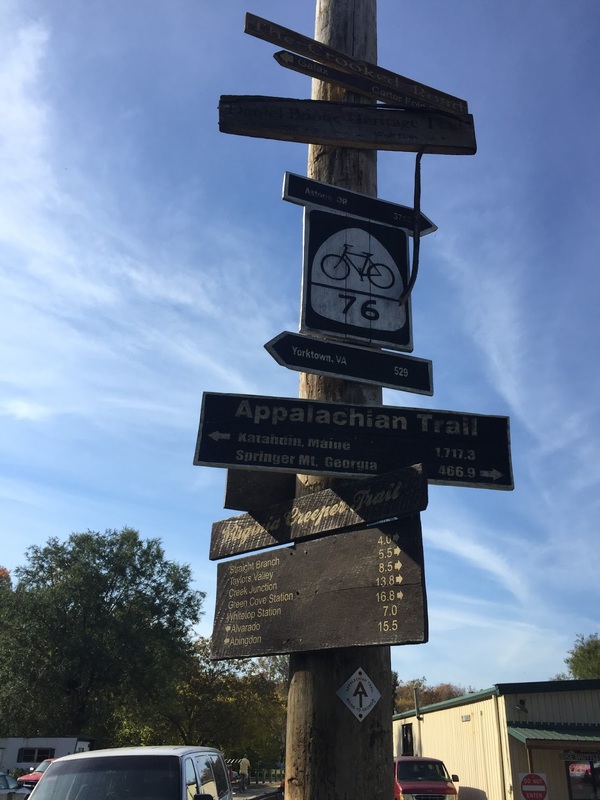 Appalachian Trail descends to U.S. 58 before crossing and joining the Virginia Creeper Trail again. On the combined Creeper/Appalachian Trail, entering the Damascus town limits. Just in town, next to the sign below with mileages to many different places (including the northern and southern termini of the Appalachian Trail), the A.T. splits from the Creeper Trail. Although I was glad no longer to be sharing a trail with some pretty fast cyclists, the trail through Damascus is surprisingly hard to negotiate. The point where the trails split is obvious; the direction the A.T. takes is not. It actually follows U.S. 58, with blazes on telephone poles and not a lot of room off the highway. In Damascus, you CAN get there from here! though there isn't much room along the highway to walk. The A.T. goes right through downtown, past multiple bike rental/shuttle businesses and Mt. Rogers Outfitters, a camping store that is legendary among thru-hikers. I checked it out, and it was a good place but nothing spectacular. I still bought a hat advertising their business, along with a "Virginia A.T." patch - promised myself not to get one until I actually completed the state, and cheated by one day. They also helped me decide where to eat that night, by calling in a "to go" order at the burrito place around the corner, Hey Joe's. There are multiple hiker/cyclist hostels in Damascus. This is Crazy Larry's Hostel/Store, as seen from the trail. 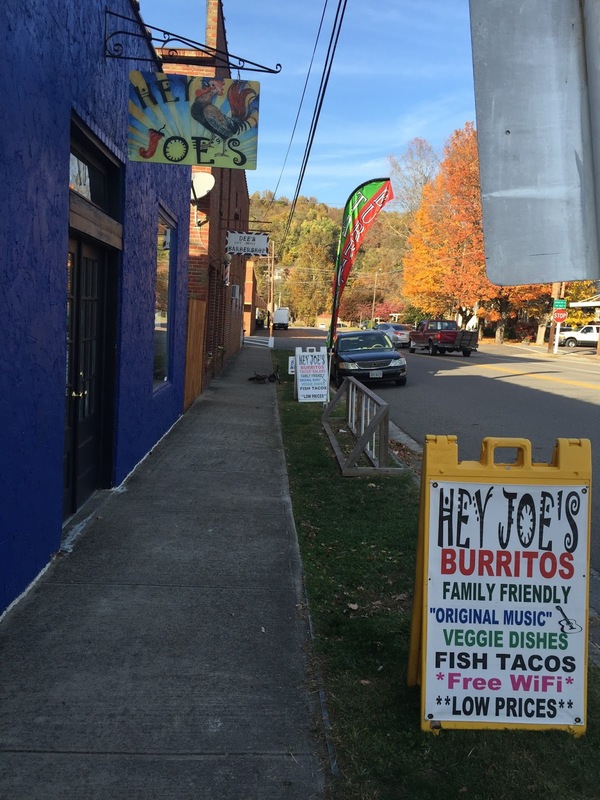 One of the many bike rental/shuttle places in downtown Damascus. Another hiker hostel - Hikers Inn. The A.T. heads down this multi-colored sidewalk past Mt. Rogers Outfitters. my fine dining destination for the night. I took my burrito and my hat to my bed for the night, at Woodchuck's Hostel. Hostel owner Chuck had put up with multiple false starts as I searched for the best weekend to finish the trail, and shuttled me back to my car when I showed up at his hostel. There was always activity at his hostel, with a couple of great kids and some friendly dogs wandering around the yard. I recommend Woodchuck's Hostel - it was further off the road than the other hostels I observed in town, and Chuck is a nice guy. Entertainment at Woodchuck's Hostel, with Chuck tossing the beanbag. On my shuttle, I was able to ask Chuck about Damascus and the hostel industry and how a guy from Montana ended up with a hostel in Damascus. He was a great conversationalist. And I enjoyed the hostel, though the only other guy staying there that night was in the same room as my dog and me, and he was up multiple times using the bathroom in a loud manner (if you catch my drift). I could have done without that guy. The next morning I was up early, enjoyed Chuck's waffles, and then hit the trail again by 7:40. I was ready to finish this up! Heading back to the trail, I hiked through a town park before turning onto a street and taking the trail into the woods. When you leave the street, it feels like you are walking through someone's yard, but there is a prominent "Appalachian Trail" sign in the yard. Here is the morning view from the hostel. A park in town has the old Deep Gap Shelter, formerly just south of the Mt. Rogers Trail on the A.T.
Out-and-back to the Tennessee border took me 2.5 hours, plus 10 minutes sitting at the border and soaking in the accomplishment and texting home. I felt kind of like I was on the edge of darkness, because I have researched many times the miles in Virginia but know nothing at all about the miles in Tennessee. Virginia is light, but Tennessee is dark. I don't want to know anything about the Tennessee miles, because I don't want to start plotting how to complete those miles. After some 5 years plotting the Virginia sections, I now need to simply appreciate completing Virginia - the longest of any trail section in a single state. This sign is at the Tennessee/Virginia State Line. I turned around here, and have no idea where Spivey Gap is. My A.T. experience by state is pretty much all or nothing. Even though I now have every mile in Virginia, I have no miles in Tennessee, North Carolina or Georgia to the south. I have about half of Maryland's 40 miles, but no miles in Pennsylvania, New Jersey, New York, Connecticut, or Massachusetts to the north. I have completed West Virginia's four miles and a few miles in Vermont, New Hampshire, and Maine. as I returned to Damascus after completing the entire A.T. in Virginia. It has been a great trip! I am really glad that I set the goal to complete the state - it gave my hiking a lot of focus over the past few years, and along the way I saw some great views and more importantly met some incredible folks. I could not have completed this adventure without the help of many folks along the way, and I have attempted to thank each of them. I am most appreciative of the help of others along the way.